Arash's World: The American Founding Fathers – Heroes or Swindlers? The American Founding Fathers – Heroes or Swindlers? For some time now I have been quite fascinated with early American history, including the founding fathers of the Revolution, the Declaration of Independence, the US Constitution and the first presidents of the United States – in short, the global experiment that was to become the United States of America, a nation that has managed to propel itself to a global superpower in its relatively short existence. I am also surprised with the admirable level of individual liberties in its heyday, which can be contrasted with its apparent lack or restrictions of freedoms throughout its own history. How can the land of plenty and of dreams and opportunity at the same time systematically conquer and oppress its own denizens as well as foreign lands? How can both freedom and lack thereof be a symbol and trademark of the same nation? In search for such answers I decided to look for America’s founding moments and used, for the main part, Howard Zinn’s national bestseller People’s History of the United States as my reference point. Some may immediately dismiss this work as being rather biased or too focused on its own political motivations, but I shall disregard that since the same can be said about traditional history books and other documents on this era; they also tend to distort and omit information and facts for their own convenience in assistance of their own particular political motives. So let us start with the American Revolution. Now it had been my impression that this was a case of budding national identity and conscious independence from the occupying British forces. This was presented in my mind as a somewhat romantic revolt of the oppressed against the oppressors similar to and predating the French storming of the Bastille with its glorious (at the time quite revolutionary) slogan of Fraternity, Liberty, and – most importantly – Equality. England at the time had its own shares of wars on the new continent mostly against the French, and although merchants were able to rack up fortunes in this situation, for most people it meant higher taxes, unemployment as well as poverty. With the Stamp Act in 1765 the British Empire taxed the colonists to pay for the French war, which elicited uprisings here and there and culminated in the Continental Congress, an illegal government, that favored separation. 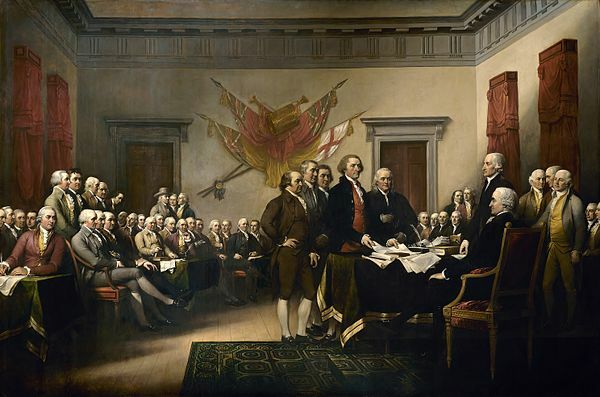 This committee adopted the Declaration of Independence, written by Thomas Jefferson on July 4, 1776, declaring not only independence of England but also stating that all British law was to be null and void, which would, of course, include the hated Stamp Law or any future taxation imposed upon the wealthy elite of the colony. Now I tended to see this declaration of independence as a revolt of the masses against the British occupying forces, but this was not necessarily so. First, many Americans were omitted from the get-go, including Indians, black slaves, and women. When the founding fathers proudly proclaim that all men are created equal, that linguistically not only excluded women in their point of view, but also all white men who did not have any property to their name. As a result, all those who were property-less were not allowed to vote or participate in town meetings. Apart from the aforementioned blacks and slaves (freed or not, plus there was also a small proportion of white slaves among them), Indians (whose very land was occupied by the colonists to begin with) and women (who still used their little influence to shape a war against slavery as they intimately knew what oppression and lack of rights felt like, regardless of their status or wealth), this also included sailors, journeymen, apprentices, and servants. To Jefferson’s defense, a man that despite it all I have strong admiration for, he was generally against slavery and he initially wanted to include black people in this declaration. Yet this did not sit well with most of the politicians of the time and would have created an evident dilemma for the slave owners in the South. Furthermore, since Thomas Jefferson himself owned slaves, it would have been hypocritical for him to push for similar rights for that large part of the American populace. So the rights of black people had to be shelved until after the Civil War, pushed somewhat further with the Civil Rights Movement and even today they are broadly speaking still not on equal footing with the white population. What is also striking in this exclusion of most American residents is the fact that a lot of them had actually fought in the war for independence and ended up in the same, if not worse, condition as before. In fact, patriotism was invoked in the general population to rebel against the British forces in order to obtain freedom and independence, but little did they know that they were merely fighting for the increased rights of the elite few. Such situations are nothing new today since ideas of patriotism and civic duties have led to mindless acts and wars throughout American history. In addition, many of the poor were given the opportunity to make some money by enlisting in this cause, the same way, the military ensures that they can attract and motivate those who are desperate with hopes and promises of benefits, economic and otherwise. Although military service was mandatory at the time, the rich could pay off their duty or provide a substitute. This is aside from government officials, ministers, and Yale students and faculty who were automatically excluded from military service. On a different note, African-Americans, Indians, and mulattoes were immediately excluded, perhaps because the government did not want to teach them military skills that could be used against itself. For instance, Blacks had requested to fight in the Revolutionary War in exchange for their freedom, but George Washington flatly rejected them. The South continued to be reluctant about arming the Blacks in fear of a large-scale and violent slave uprising. We can see that patriotism played a role in inciting masses to wage war even in America’s early days. But come to think of it, it is rather strange to speak of feelings of patriotism in a place that did not officially exist yet! There was no America or American culture or identity to speak of, so what was the root for this patriotism? It might have been an indiscriminate ideal, but it cannot be equaled to the liberation of other cultures who had been oppressed by occupying forces yet had a clearly defined and demarcated culture and tradition, for instance, the East Indians against the British forces. Essentially, the British and the American settlers and colonists were not too far apart in culture and tradition. Finally, as Howard Zinn claims, ruling elites are aware of the fact that war is a way to secure themselves from any kind of internal war. This would be the time to unite against the common enemy outside and often across the border, be it a threat from Nazis, Communists or, more recently, terrorists. As such, some of the domestic problems can be swept under the rug in the heat of the moment thereby ensuring the continuous existence of a status quo favoring the rich and wealthy. Let us provide another example here. In Maryland, according to the constitution of 1776, if you wanted to run for governor you had to own 5000 pounds of property; for senators, it was 1000 pounds. In other words, a whopping 90 percent of the population had no chance of holding office, and this practice is in many ways continuing today and is somewhat extended through lobbying forces as well as media exposure; it may come as no surprise that there is a billionaire vying for the President’s office as we speak. There are also two more observations I would like to add on here. First, although the American Revolution is said to have brought about the separation of church and state, this is not exactly so. After 1776 the northern states adopted taxes forcing everyone to support Christian teachings. In fact, religion was embedded in almost every aspect and institution of the American way of life, not to mention, the language and expressions of the common people as well as politicians. It is strange to see common phrases like “In God we trust” or “God bless America” in what is deemed essentially a secular state and government. Moreover, Zinn makes a valid point about the government and its parties. The two-party system in the United States gives its citizens a certain amount of choice, yet that choice is limited in many ways. One thing, however, that both parties, regardless of political motivations or ideology will have in common is to protect their own interests. This may be in terms of influence or wealth, but it is also regarding their own status as a political entity. A government cannot and will not (and I would even argue should not) be against itself; put differently, a government cannot be anti-government or else it would shoot itself in the foot. However, a wider array of choices would be a good idea as it could reflect and integrate other voices and provide a more balanced government; while independents are gaining ground, they are still far away from having significant influence in the political process, Bernie Sanders and his revolutionary movement excepted. So what did the United States do once they had secured their free and independent nation? After the British had lost all control and say over the colonies, the Americans decided to expand their territory. They fought against the Indians or tricked them with false promises and revoked contracts and deals, including morally and even legally questionable Indian Removal acts and treaties; they took over parts that had belonged to Mexico and Spain, such as California and Florida, and they also fought the Mexicans in order to appropriate even more land. To conclude, I am not quite sure whether the founding fathers were heroes or swindlers, but would perhaps settle somewhere in-between (although I do believe that Thomas Jefferson was indeed ahead of his time in many ways, followed by John Adams to some degree). Interestingly – and conspiracy theorists hold onto your hats - both of these founding fathers not only died on the same day but it happened to be also Independence Day, the celebration of the birth of the American nation, on July 4, 1826! What we ought to keep in mind, however, is the fact that we should balance and measure our perception of historical events in their own given context. Case in point is the often-cited Second Amendment. This was at a time where there was still the danger of losing one’s independence as a budding nation as well as the danger of being attacked by Indians, or rather, it served to give Americans the means to fight against the Indians. It was also generally a time of survival under harsh environmental conditions where the rule of law had not been fully established or enforced yet. The situation is quite different today and current day weapons have changed as well. The old rifles could not even come close to the power of harm and destruction that modern weapons inflict and we see this embodied in horrible tragedies of current mass killings. Using modern weapons under the guise and pretext of the Second Amendment would be the same as allowing people to use tanks and grenades for their safety, which is a rather ludicrous idea. Also, we must rethink the way language was used in the past. The freedom and liberties we have today, we often take for granted, but in its founding moment, this was very new and untested territory indeed. Freedom of speech and religion are things of utmost importance, and the founding fathers may have realized this, but they lacked the historical experience and hindsight we have today. That makes it all the more important to not only safeguard those liberties but ensure that they are upheld and enforced by our follow citizens as well as politicians now and in the future. The American nation was built on great hopes and promises and has often fallen short on them in its own history, including the witch hunt of the McCarthy Era. Sure, in its foundation, there was a lot of self-interest involved. The game was rigged in favor of the wealthy elite from the beginning and is embedded in its constitution. Yet at the same time, there is also so much potential in it if it is followed religiously; especially if its laws and clauses are fully enforced and expanded, such as the statement that all men (and women) regardless of religion, race, or sexual identity are created equal and are consequently given access to the same rights and opportunities as any other citizen. This is the American Dream indeed, and hopefully this great nation does not lose sight of these noble goals.